A brand new Camaro SS Convertible will do 0-to-60 MPH in roughly 4.8 seconds. The brand new SRT8 Jeep Grand Cherokee will do it in about the same time. I knew that. The young woman in the Camaro SS next to me looking to sprint down the mostly abandoned section of rural Texas highway clearly didn't. I couldn't measure the surprise on her face as I casually left her behind at the stoplight because she was too far away. The latest SRT8 is a lot like the Spanish Inquisition in that it's both violent and unexpected. It puts the Torque in Torquemada. We live in a time where engineers can make vehicles that look like weird truck-wagon mixtures perform better than the sports cars of the previous generation. In the future, these vehicles may well be the hallmarks historians point to in order to portray the unseemly excesses of a culture hell bent on its own violent self-destruction. It's not the future yet and violent self-destruction is fun. Compared to the previous generation the line on the latest Jeep is that it's apparently more refined — a nod to the German platform underneath. That's overstating it a bit. Rommel was apparently a gentleman but I wouldn't want to be staring down the nose of his panzerkorps, if you know what I mean. So you know the Jeep SRT8 has the surprising fury of the Spanish Inquisition and the "refined" strength of the Desert Fox. How much more history can I squeeze into this review? I drove the SRT8 to the Circuit of the Americas venue, which was under construction for a future US Grand Prix (which I think they should call the Texas Grand Prix because "You can all go to hell, I'm going to the Texas Grand Prix" would make a great shirt). Where The Hell Is America&apos;s Next Great Sports Venue? This is one of the few Jeeps you'd be able to drive on the unfinished, muddy turns about as quickly as on the finished track. Jeep's regular Grand Cherokee is already one of the most attractive SUVs ever built, taking the best concepts from the Larry Shinoda-penned original design for AMC and updating it for the future with cleaner lines. Add in the aggressive fenders, scooped hood and mesh-backed grille and it's a visage replete with masculine beauty. Maybe this is how Cleopatra looked. From an enthusiast's perspective, the flat-bottomed steering wheel makes the car. The leather wrapping feels great. I want to grab it in the same way all those women running out to see Magic Mike want to grab Channing Tatum. Too bad the cheap shift paddles are so wimpy. The gauges are typical Chrysler in a good way (direct and easy to read) while the dash materials are typical Chrysler in an old way (cheap plastic). The seats are supportive and comfortable for long rides. It's not as luxurious as BMW or as sporty as a Porsche, but I covered a lot of miles across Texas without an issue. These numbers aren't weighted to class, but there's no world in which a sub-5.0 launch to 60 mph isn't impressive. Not only does the Jeep launch easily off the line in both Track and Sport modes, it makes such a great noise doing it there's no easy way to stop from being a jerk and doing it all day every day. The truck's 6.4-liter Hemi V8 throws down 470 horsepower and 465 lb-ft of twist on all four Pirelli-clad wheels. It's not a ton of power considering the truck's 5,150-pound heft, but displacement wins the day. Just think of Belushi in the little chocolate donuts commercial. Sometimes big things go fast. If we were doing this on relative distance-to-weight we'd give it a 10/10 because somehow the Titanic manages to stop us short of the iceberg every time. How do you spell relief when you get too heavy on the go pedal? B-R-E-M-B-O. Six pistons up front, four out back, painted red, though just a little too progressive under heavy pressure. On a grand scale it doesn't measure up to a McLaren, but not much does. Even enthusiasts have families (from which to breed more enthusiasts) and you won't have to sacrifice them — on road or off — to enjoy the vehicle. Some might complain the adaptive dampers soften the SRT8, but it's not quite like putting Moon Boots on Usain Bolt. They're more like my Onitsuka Tigers, giving the SRT8 a nice blend of sport and comfort dependent upon conditions. My only complaint about the ride is it sometimes lulls the driver into forgetting about the power hidden underneath the vampire-bit bonnet. A little feel goes a long way with these big SUVs and I'd like just a little more. I've only driven one thing that handles better than this and weighs about as much and that's the Porsche Cayenne Turbo. This thing beat an X5 M piloted by Matt Farah during One Lap and pulls 0.9Gs on the skidpad. In Track and Sport mode Spinelli found the electronic rear diff did a good job of vectoring torque between the rear wheels, especially during braking under sharp steering. To quote his review "While disorientating to look down on creation from SUV level, the Cherokee in Track Mode is remarkably tossable. Perhaps not as precise as its heighty-weighty competitors from BMW and Porsche, but it's still a ton of fun. Make that 2.5 tons." It's like a refined muscle car, capable of happy oversteer with the proper throttle application with an edge of understeer to account for the boat anchor sitting out in front of the firewall. Is this thing AWD? It's hard to tell sometimes. Want to know what a completely adequate gearbox will get you? A 5/10. There's something a little silly about putting a 5-speed auto in a vehicle like this. It is the muscle car of the SUV/CUV world, but a sixth gear would be great on long highway drives. Combine that with the cylinder de-activation and it might get better than 18 MPG on the highway. It is my single greatest desire with this vehicle. In fact, the only thing saving this from getting a 4/10 is the little paddles. The Jeep SRT8 comes standard with a nine-speaker system backed by a 506-watt amp and subwoofer. It's fine, though I'd have preferred the optional 19-speaker system. Why? It has to compete with the 6.4-liter engine growling. I can't be the only one who wants to blast Tune-Yards and Hemi simultaneously, right? There were a lot of negative things said about Chrysler over the past few years (we said most of them ourselves), but they've had a few good ideas. The "Electronic Vehicle Info Center" is one of these. It lets you toggle between various info panels such as 0-to-60 mph time, braking distance, g-forces, and quarter-mile times. Everyone else is just catching up to this. Otherwise, my tester came with a backup camera, blind-spot monitoring, bi-xenon headlamps, SATNAV, and the bluetooth UCONNECT system. Nothing earth-shattering, but it works. 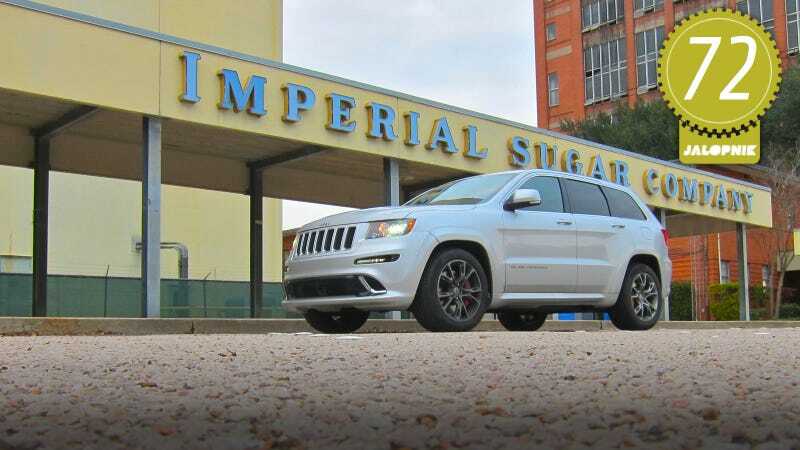 The 2012 Jeep Grand Cherokee SRT8 is not better than a Porsche Cayenne Turbo. I know it. Jeep knows it. Everyone with a brain knows it. The Porsche Cayenne Turbo also starts at $108,750. The Cayenne S is a more reasonable $65,860, but it's just not as mean as the $58,290, nicely-loaded Jeep. If I wanted fast and had $60,000 to spend I wouldn't get a Jeep. But the "Central American businessmen" and "Russian industrialists" who buy these things by the Antonov AN-225 do so for a reason. They're big. They're mean. They're easy to tune and they'll kill you. They'll kill you dead.